Because of this question that goes on and on and on, I have to go to McDonalds today and tomorrow. Today is not tomorrow yet because the next range of freebies from McDonalds is only coming out on Thursday. Cis, I thought it is Wednesday and got dragged by the kids to McDonalds. Evil man, this Ronald McDonald. He must have casted a spell on all the children in the world. How the kids can eat McNuggets almost every day if they can get a new toy each day. I have another date with Ronald McDonald tomorrow morning. Because my chubby cheek, dimpled toddler wanna an orange and blue car next. In case you all dunno, The Cars is a movie by Pixar. This red number is Lightning McQueen. 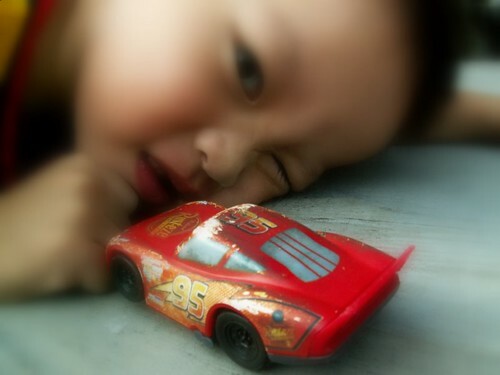 Cars Is the saga of Lightning McQueen, a hot-shot animated stock-car voiced by actor Owen Wilson. 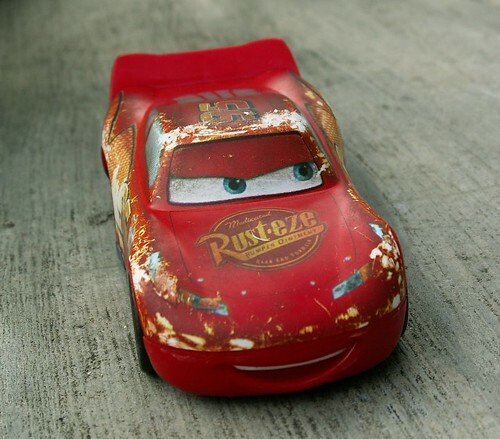 In route to a big race, the cocky McQueen gets waylaid in Radiator Springs, where he finds the true meaning of friendship and family. Is it tomorrow yet? Is it tomorrow yet? Is it tomorrow yet? By LilianIn Family18 Comments on Is today tomorrow yet? I wish I’m still living in yesterday. Wow… superb pictures. Vivid colours. How many megapixels does your camera pack? Ken – Only 4.1 MP. Actually, it is not so much the megapixels but the camera brand. Konica tend to get these sort of colours and Canon will have a more ‘soothing, brownish’ tones. Bryan – Like that? Wait they create the time machine. I want room in time machine. Then I go back in time and invest in McDonalds. Then I can blog from my yacht. aww..he’s got dimple just like me! You didn’t get the free poster? Remember to ask for it. My kids can’t stop staring at the various cars on the poster. And yes, after a week, his car looks exactly like your toddler’s, paint all came off from chewing on it! Thank God my daughter grew out of all those things! Once, even had to pay one of my students double to get him to queue for one of those Hello Kitty dolls!! Wonder where it is now? Probably in the storeroom or given away to some Children’s Home. BTW, Lilian, your photos ARE nice! eh, that toy just came out your son scratched it until lidat oredi ah? remember ornot the time mcd came up with these teddy bear series. people q for the outlet to open until the glass dor smashed to pieces. 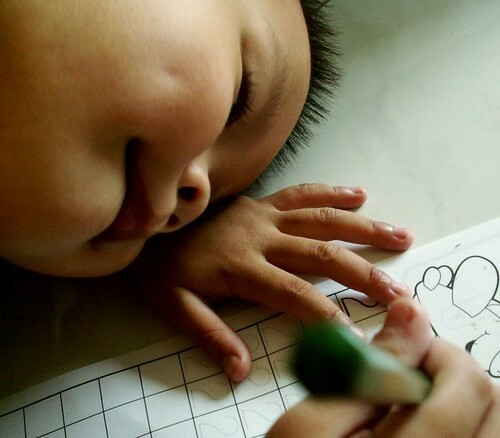 awww… i can’t even begin to imagine how much u love this chubby cheek, dimpled toddler…bless u! Tat Ronald McD cast a spell on me too. Now I’m so hooked up wit Happy meals. Immom – No lah, the paint is like that wan, purposely look rusty. But this red car is quite good ‘cos it can really speed and the front can tilt up somemore. sotongking – Happy Meal how to fill up an adult stomach wei? sooi2 – Yeah, he is spoilt rotten liao by all of us. fire80 – Ya, those dah keterlaluan already. The Hello Kitty series lor. simon – No lah, original like that, errr…I think so la. Hahaha, now so many ppl ask me I oso dunno what is the original paint. But it has taken a lot of hard knocks. moo_t -Yeah, both the same. QV – Wah… STP very smart hor? Child abuse like that. Akehkekeh. gimbot – My kids sat thru the whole thing, very captivating. Nice scenery, both real or otherwise. STP – Ya, that Hello Kitty was a crazy wildfire. Especially in Kiasuland. MG- Only for the RMC kids la….But nvm, got online poster liao. SA – That is a one hell of a good marketing. I marvel at their consistencies throughout the world. Hehe, I only can afford McD in every part of the world. Even in Paris (where they don’t sell chicken, duh).